Your home's exterior paint takes a beating everyday - rain, snow, wind, sun and just about anything else Mother Nature throws at it. That's why it's so important to have your home re-painted regularly to protect your investment and prevent costly damage down the road. 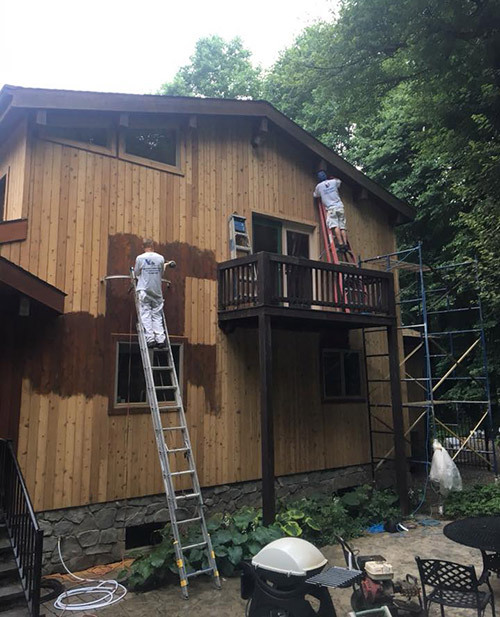 Since 1988, Ville Painters has specialized in high-quality professional exterior painting on homes of all ages, shapes and sizes. Whether your home is fairly new or over 100 years old, you'll love the quality workmanship and attention to detail we put into every job we do. Contact us for a free estimate for your home or office today! Many homes in the Lancaster area require additional attention and protection due to moisture and age. You can be confident that we'll look over your home as we go, often finding small issues and helping you address them before they become big concerns. For example, roofing and spouting issues can often lead to wood decay. At Ville Painters we take more time than the average professional painter to properly prepare every surface for paint. Plus, we only use top-quality materials. The result is a paint job that provides superior protection, longevity and value for your money. The paint on each side of your home ages differently depending on how much sun it gets and a variety of other environmental conditions. We can keep your home looking great and provide extra protection for trouble spots by only painting the areas that need it most. Maintenance painting is affordable, often costing pennies on the dollar when compared with a whole house paint job. Our experienced painting crews have all the right equipment to access every area of your home safely and efficiently. We're fully insured and run regular safety meetings and inspections for your peace of mind. today for a free estimate for your home or office.